Hi, I am interested in your 1971 Ford Bronco (stock #CTP2402) listed on Autotrader for $119,900. I'd like to get more information about this vehicle and confirm its availability. To view current and upcoming inventory please go to our website Worldwide Vintage Autos . c o m . If you do not see the vehicle you want in our inventory, make sure to sign up for VIP UPCOMING INVENTORY , found on the left side of our homepage. Worldwide Vintage Autos is pleased to present this 1971 Ford Bronco. Built by Kenny Hauk / River Raider Off-Road / History Channel. We have had the fortunate opportunity to own / consign hundreds of Ford Broncos. In our opinion, this Bronco is the ULTIMATE build. Modern chassis and ICON suspension, 400+ HP new fuel injected Coyote motor paired with an automatic transmission. Four wheel disc brakes, AC, diamond stitched leather, etc. It does not get any better than this. 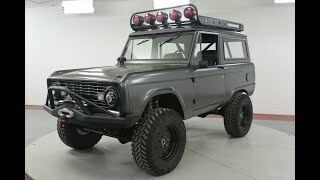 To replace / build this bronco you are looking at an estimated $200K plus and several years. The Ford Bronco is a model line of SUVs that were manufactured and marketed by Ford from 1965 to 1996. After the first generation of the Bronco was introduced as a competitor to compact SUVs (including the Jeep CJ-5 and International Harvester Scout), the succeeding four generations of the Bronco were full-size SUVs, competing against the Chevrolet K5 Blazer and Dodge Ramcharger. The first Bronco was assembled using its own chassis2, while the full-size Bronco was derived from the Ford F-Series (F-100, later F-150) pickup truck; all Broncos were produced with four-wheel drive powertrains. - Black diamond stitched leather front seats. Matching rear bench seat included. Deposits to hold vehicles is $500. Upon payment of the $500 deposit, the vehicle will be held for 72 hours pending final payment. Deposits are non-refundable due to i). the vehicles are taken off the market and we turn down other buyers during the 72 hour period and ii). there is significant re-marketing costs associated with relisting / remarketing our vehicles.